Here is another taster from THE LOVEDAY SECRETS. An old adversary returns and for Adam and Senara secrets could be uncovered from the past that could destroy their reputations. An hour later Adam returned to Boscabel still unsettled by the visit from the lawyer. Since his last meeting with the excise officer he had not given Beaumont much thought, but with Sawle hanged and no longer a threat to Beaumont, it did now seem strange that he had not been seen patrolling these waters. Sawle had not been the only smuggler operating in the district. Unwilling to upset Senara, he pushed his fears aside. His wife had enough worries with the arrival of the boy who had lost his memory. Yet it had never been easy keeping anything from his wife. She was incredibly perceptive at sensing a person’s moods, her gypsy blood giving her an uncanny intuition concerning people and their future. Her premonitions had been proved right on too many occasions for him to doubt her ability. She had always feared Beaumont’s vindictive nature, and had not the excise officer shot Edward Loveday when Beaumont had been in the pay of Harry Sawle. Adam shuddered. He had thought the smuggler’s death would have freed him from the sinister shadow the man had cast over their lives. Then annoyed at the way his common sense had deserted him, Adam drew a sharp breath. He did not fear ghosts or any man alive. Yet he could have wished that his last meeting with Beaumont had been less acrimonious: that he had not lost his temper and threatened to run him through if he ever found him snooping on Loveday land again. Beaumont had not been seen in the area for months when Adam had met him in a chance encounter close to his cousin Japhet’s land at Tor Farm. With Japhet out of the country, the farm had been rented to a tenant. Adam had been out returning from a visit to Sir Henry and as it was a fine afternoon had taken a detour to ride past Tor Farm and assure himself that all appeared in good order. Since a previous tenant of the farm had allowed contraband to be stored in the barn against the express instructions of the family, Adam kept a closer eye on his cousin’s property. He had been alerted by a flash of light coming from a small coppice. It could only have been caused by sunlight glinting off metal or glass. He had dismounted and approached on foot to see a lone figure crouched behind a tree with a spyglass to his eye, watching the farm from the cover of a small coppice. Across the fields the tenants twelve year old daughter Millie was standing at the water pump. From the state of her bodice and skirt she had slipped over and landed in horse droppings. Her mother was berating her and pulling at her skirt and top as she stripped it from her to soak in the water from the pump. Millie was crying and the water splashed over her petticoats moulding the linen to her budding figure. ‘Have you taken to spying on young girls?’ Adam had sneered. ‘I warned you to stay off our land?’ Adam challenged. ‘As an officer of the crown I have my duty to perform. The Loveday’s may proclaim their innocence but you have been hand in glove with smugglers in the past. With Sawle as a brother-in-law what else would we expect? You even built a ship for Sawle so he could outrun the revenue cutter. For all we know you are in partnership with him. It would not be the first time your land has been used.’ A head shorter than Adam, Beaumont’s thin face was now heavily scored with lines of debauchery and excess. ‘I was doing my duty. He resisted arrest.’ Even though Beaumont had to tip back his head to look up at Adam, he glared along his hooked hose with arrogant disdain. ‘We both know that is a lie.’ Adam had closed the space between them, his fists bunched as his anger ground through him. He could see sweat glistening on Beaumont’s face. ‘Lay a hand on me and I’ll have you arrested for attacking an officer of the King about his duty.’ Beaumont blustered and fumbled to draw his sword. Beaumont was backing away to where his horse was tethered, his sword held ready to counter an attack. His boot entangled in the knee-high bracken and he stumbled. Adam leapt forward and ducking the lunge of the blade landed a punch on the officer’s jaw. At the force of the blow Beaumont dropped the sword and Adam swiftly delivered two more blows to his head and body. Beaumont was knocked to the ground and covered his head with his hands. Adam picked up the fallen sword and pointed it at his enemy. His cowardice disgusted Adam. Because of him his father had died. He did not deserve to live. Yet where was the honour in killing such a coward? Breathing heavily, Adam had controlled his anger and stood back. ‘Any smuggler who uses our land to store their goods knows that we will summon the authorities.’ His voice was thick with warning. ‘Get on your way, Beaumont. This time I will not stain my hands with your craven blood. But if I ever catch you within a mile of our land again I will know your actions are intent upon dishonouring our name and I will kill you.’ He slashed the sword down on a granite boulder in the undergrowth and the steel snapped in two and he threw the hilt as far as he could. Adam had turned from him and walked away. Yet for some days afterwards he had expected the militia to arrest him. Nothing had happened and he assumed that Beaumont had slithered away to lick his wounds on the other side of the county. It was not until he remembered the incident now that he recalled that at the time Beaumont had not been in his naval uniform. If he had not been on duty what had he been doing in the area? A new cousin was introduced to the series in The Loveday Secrets who brought with him a dark family secret that could destroy them all. This is an extract of their reunion. ‘Adam, St John, Thomas, at last we are all together. Will you not greet our dear cousin Tristan Loveday? 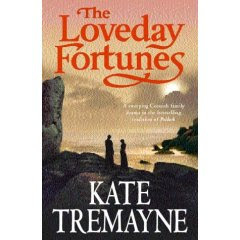 I believe you thought him dead these past twenty odd years,’ Tamasine Loveday excitedly announced. There was a frozen silence from the men. Tamasine was shocked by the naked fury on her brother Adam’s face. ‘I know what I saw that fateful night. You brought shame to us all,’ Adam flared. Still bristling with fury, Adam swivelled on his heel and marched from the room. Throughout, the exchange St John had allowed his twin to speak, a look of horror on his face. Tamasine regarded St John with astonishment. ‘I thought this reunion would be a delightful surprise. What possessed Adam to take so violently against Tristan.’ She was shocked that Adam, the most reasonable of men, could regard one of their family as an enemy. ‘She does not know how you betrayed us. I will not stay in the same room as you.’ St John also marched away. The darkest night of his life had come back to haunt him. And if the truth were ever known it could be the cause of his ruin. 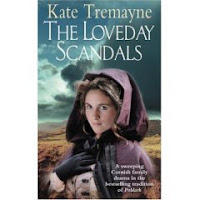 THE LOVEDAY SECRETS is published in paperback by Headline on 11th December. The Loveday Secrets was published by Headline in hardback on 1st May 2008. The paperback is not available until December. Here is an extract from the first chapter. St John Loveday cursed the day he had wed Felicity. He had been in debt then and thought the young widow a wealthy prize. He had not learned the truth that her fortune was so paltry until after they were married. Then after a year of marriage she had presented him with another daughter instead of the son he longed for and his feelings for her had turned to loathing. There was a low rumbling like thunder behind him. Dragging his wits from his reverie, he barely had time to pull his horse into a gateway to a field before a coach sped past at a reckless pace. Briefly, he glimpsed the straining horses that were white flecked with sweat, and the near side wheel creaked as it rolled over a small rock. There was a rush of wind as it rattled past and the vehicle missed St John and his mount by less than a hands breadth. Was the driver drunk or a madman? St John saw the coach sway dangerously as it continued round a bend. When his horse reared with fright, he was almost unseated before he brought it under control. The near collision frayed his nerves and his temper and he cursed roundly. ‘Confounded idiot! You could have killed me.’ St John’s shout was lost in the night, his mood turning even bleaker. It took some moments to calm his horse that continued to snort and quiver in its terror. He had been lucky not to be severely injured. Downing the last of the brandy, which swirled warmly through his veins, he soon felt its calming effect. Not so many years ago in his early twenties, he had regularly diced with death. His guilt was making him paint too black a picture of his life. Trevowan had been free of debt for a year and that at least had enabled him to mortgage the estate as security for the loan he needed to settle his gaming accounts. He had overcome financial losses before and he could do so again. He did mot know why gaming could take a hold upon him and make him take risks with the security of his home? Yet he knew that the excitement of the turn of a card, throw of a dice, or wager on a horse race was something his blood craved beyond caution or reason. The quantity of brandy he had drunk and the steady clop of his gelding’s gait after what had been a long day in the saddle began to tell on him. The breeze whipped the May blossom from its branches so that it fell like snow upon his shoulders and the air was sweet with the scent of bluebells. He pulled the collar of his coat around his ears against the chill in the night air. His eyes drooped and he slackened his hold on the reins. In the distance he heard the clock in the tower of Penruan church strike nine. Not far to ride now. The horse would find its own way to the comfort of its stable. As his head began to nod, he allowed his body to be lulled by the rhythm of his mount. The narrow lane had widened into an open space with tracks leading off in five directions. He proceeded slowly and tied his gelding to the broken wheel of the vehicle lying on its side. He shook his head to clear it of the cloying effects of the brandy that made his thinking sluggish and he stared blearily at the wreckage. The coach’s axle was broken and some of the luggage was scattered on the ground where the straps had broken at the violence of the accident. He walked along the coach’s side noting that before toppling over the front of it had first smashed against the dry stone wall, splintering some of the wood. The shaft the horses were harnessed too had sheared off and no doubt the animals had bolted. Or had they been taken by the occupant of the vehicle to continue their journey? he wondered. Surely though they would not have let so many of their possessions for anyone to steal? He rubbed his temple forcing his mind to function more rationally. He stared at the scattered objects and discovered that one of them was human in shape. His step waved precariously as he advanced on the figure. It was the coachman, who before releasing the reins had been dragged some distance along the earth by the terrified horses. The figure was on its stomach and his legs, which were twisted out at odd angles, were clearly broken. St John knelt over him to ascertain if he was still alive. The sight of the broken and bloodied skull laying against a small boulder was evidence enough that the man was dead. St John stumbled back to the vehicle wishing he had not drunk so much. The coach must be the one that had almost run him down earlier. He needed to check whether there were injured passengers on board? For a moment dizziness made him cling to the vehicle, then he grabbed the side of the window and hauled himself up. When the scene before him stopped revolving, the moonlight revealed the bloodied body of an attractive woman in her thirties, her eyes staring sightlessly back at him. Even in the poor light there was no mistaking the expensive lace on her bodice and the glitter of gems on an exposed wrist. She was also beyond his help and there was no one else inside the coach. A rush of nausea made him turn away. What a waste of two lives. Why had the vehicle been driven at such a reckless pace? From her clothing the woman was a person of position therefore in decency he could not leave her body here all night. The furious speed that they had been travelling continued to trouble him. Such a dangerous pace was more of a desperate flight borne of fear. Yet from whom had she been fleeing? It was a question that stayed with him. Over the top of the dry-stone wall he scanned the undulating countryside. At so late an hour no candlelight lit the windows of the scattered farmsteads, and it was several miles to the nearest hamlet. He doubted anyone else would be on the road this late, unless they were smugglers or vagabonds. They would strip the woman of her finery and steal anything of value. He strained to hear some sound of an approaching traveller. There was nothing only the song of a nightingale and the croak of toads in the nearby dewpond. He turned at a scuffling in the hedgerow and a family of badgers, the white stripes on their faces clear in the moonlight, scurried across his path. It was a reminder that hungry foxes would feast on a corpse if left in the open. Clearly, he could not leave the woman’s body here but it would not be easy hauling her out of the carriage. He would need to stand on a chest or something to pull her body from the conveyance. For some moments he stared at the scattered luggage. There was trunk on the road near the wheels that was large enough for him to stand on. Several minutes later he was sweating and weary as he struggled to lift the woman from the coach. Her arm flopped against the handle of the open door and the glittering bracelet she had been wearing fell to the ground. The clasp was broken and guessing that the diamonds were worth several hundred pounds St John absently stashed it in his pocket for safekeeping. There were also diamond drops in her ears, which he also pocketed lest they were dislodged and lost. The woman was heavier than he expected and it took all his strength to haul her over his shoulder and stagger to his horse and heave her across the saddle. Pausing to recover his breath, he wiped the blood from her face with the corner of her cloak. She was dark-haired and olive skinned, and had been beautiful in a rather foreign exotic way. He knew all the gentry in this part of the county and this woman was a stranger to him. It was then be heard a low groan. It was human and had certainly not come from the woman or the driver. Infuriatingly, a long narrow strip of cloud had covered the moon and plunged into almost total darkness he could see no sign of another figure. Then as he strained to listen the groan came again from near some elder bushes. Moving towards the sound, he stumbled over an unseen casket and crashed to his knees. As he pushed himself up from the ground, his hand encountered a slim leg partly hidden by the wayside ferns. He ran his palm along the leg clad in breeches and the moon free of its veiling cover revealed a young lad of seven or eight. There was blood on his head and pale velvet jacket. The eyelids flickered briefly. ‘Mama,’ he gasped, then went limp in St John’s arms. St John lifted him and as he walked towards his horse, his foot struck the casket that had earlier tripped him. The moon had reappeared from behind the cloud revealing that the lock had broken and its contents were spilled on the ground. His throat dried and a hot rush of sweat coated his body. He could not believe his eyes. This was an answer to his prayers, the resolution of all his problems. It was riches beyond his dreams. But they were not his. Yet who would know? An insidious voice whispered in his head. The owner of these jewels and gold coins is dead and so was her driver. Temptation had always been St John’s weakness. He closed his eyes and swallowed. He despised himself for allowing the spread of riches to lure him, even for a moment, into considering something so dishonourable. When he hoisted the boy onto his already laden gelding and took the reins to lead his horse, the clock at Penruan struck ten. The hour was later than he expected. He had no idea of the seriousness of the boy’s condition but since the lad remained unconscious he suspected it was grave. It would take him over an hour to reach his home and then a physician would need to be summoned which could take another hour. The boy could be dead by then. His twin’s estate at Boscabel was closer than Trevowan. Adam’s wife had skill with herbs and Senara had treated many injuries of the shipwright’s families who worked in the Loveday shipyard. His aching body called out for the comfort of his own bed, but the boy should be tended as soon as possible. He led his horse around the corpse of the coachman. Hopefully the foxes would not get him before servants were sent to retrieve his boby. Also the coach could not be left blocking the track and the luggage must be saved from thieves and searched for clues of the lad’s identity. 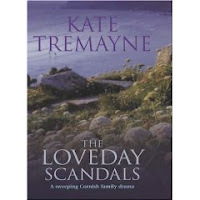 If you love the Loveday series of family novels I hope you will enjoy this blog which will give you insights into world of the Loveday family and of Kate Tremayne their creator. The blog is a response to the request of many readers to my website and I hope it will be fully interactive with comments from readers about the family and their adventures, conflicts and romances. 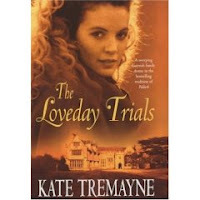 If you are a regular Loveday fan let me know what subjects you want me to cover. 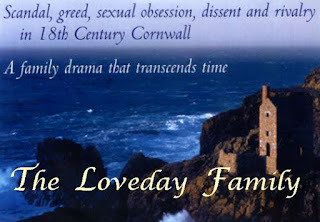 The Loveday books are set in 18th Century Cornwall and cover all aspects of historical events of the time. 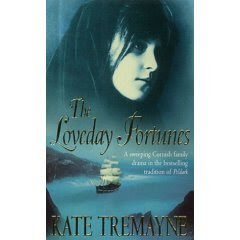 Loveday books in order of sequence Adam Loveday, The Loveday Fortunes, The Loveday Trials, The Loveday Scandals, The Loveday Honour, The Loveday Pride, The Loveday Loyalty, The Loveday Revenge and just published The Loveday Secrets. The blog will be regularly updated every week. 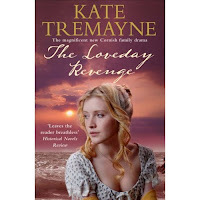 Join me again and tell any friends who are Loveday fans.